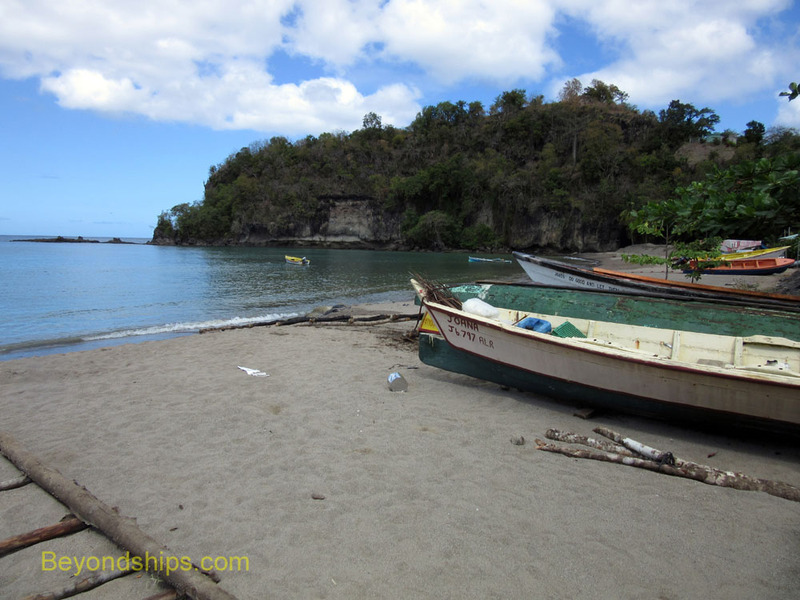 St. Lucia boasts that it has the world's only “drive in volcano.” Inasmuch as this sounded like an unusual thing to do, we signed up for the shore excursion that promised to take us inside this volcano. Located on the southwest coast of the island, St. Lucia's volcano is about 30 miles from the cruise port in Castries. 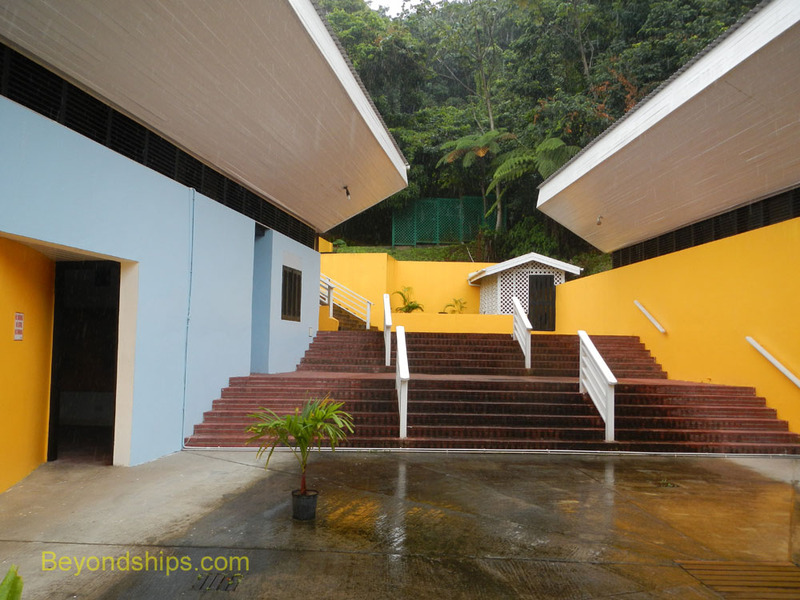 However, St. Lucia is a mountainous island and the roads wind around the steep mountains. Consequently, it takes at least an hour and a half to drive to the volcano. Much of the drive is through the rain forest, which covers much of the island. It can be quite pretty. We did a photo stop overlooking Castries from Morne Fortune and another overlooking the yacht haven at Marigot Bay. The tour also went through banana plantations and some sleepy fishing villages that have not yet been commercially developed. 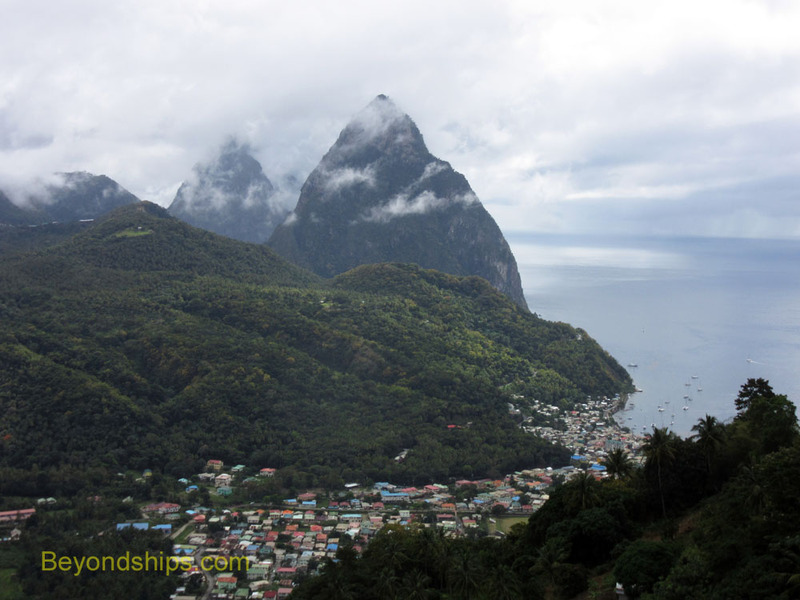 The volcano is just outside of the town of Soufriere, the original capital of St. Lucia. It is reputedly the birthplace of the Empress Josephine, Napoleon's great love. Although there are luxury resorts nearby, the town itself still retains its Caribbean atmosphere. Soufriere (French for sulfur mine) lies within the island's volcanic area. Indeed, geologists refer to the area as the Soufriere Volcanic Centre. The current geological scene was created when the volcano collapsed to form the Qualibou Depression or caldera. Two giant lava domes known as the Pitons loom over the town. Today's volcanic activity takes place outside of town in the Sulphur Springs National Park. Although this volcano is classified as being semi-active, do not expect to see flows of molten lava and spectacular displays of red hot rock shooting into the sky. In fact, there has not been a lava eruption since before the Europeans first came to St. Lucia. The last significant eruption was in 1766 and that only involved steam and some volcanic ash. 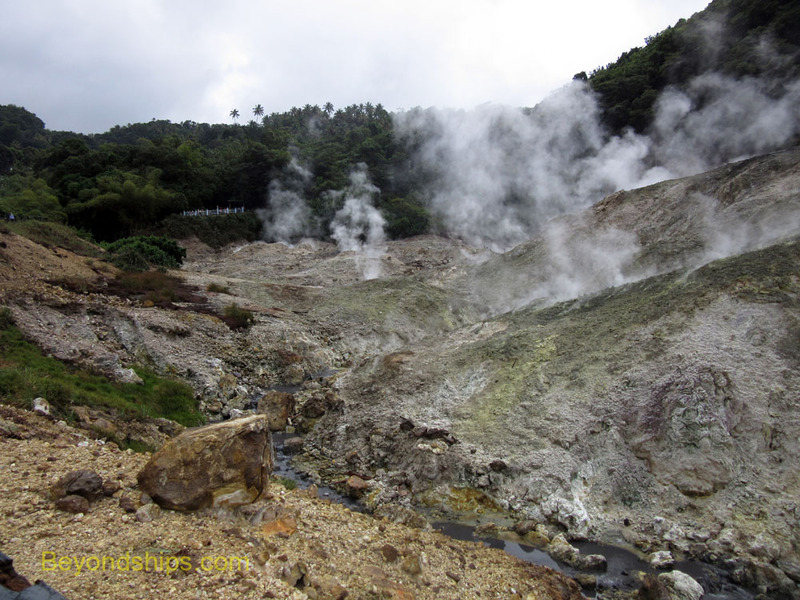 The volcanic activity today consists of steam escaping from fissures and some 24 boiling caldrons of water and mud. These lie on a slope within the crater. No vegetation grows in this part of the crater and the rocks have been stained a greenish yellow color in places by the sulphur and other chemicals emitted from the fissures. Overall, however, the area looks like a bleak, lunar landscape. Of course, a strong smell of rotten eggs hangs over the area from the escaping sulphur. It does emanate from the underworld after all. As advertised, you can drive into this volcano as a road runs along side this barren area. Mini-buses and other tour vehicles park along the road side while their riders are out taking a look at the springs. In fact, due to an accident that happened to a guide in the 1960s, you cannot get much closer to the volcanic activity than the road. There are also some viewing platforms at one end of the field that includes the springs but they just give you a different angle of view rather than an appreciably closer view. Guides offer tours of the springs from the viewing platforms. However, you can explore on your own, provided that you do not go beyond the fence that borders the springs. It should also be noted that there is an interpretation center further up the road where you can see a video and exhibits on the geology of the area. Near the entrance to the Sulhur Springs is a small bridge that straddles the stream which flows through the volcanic area. 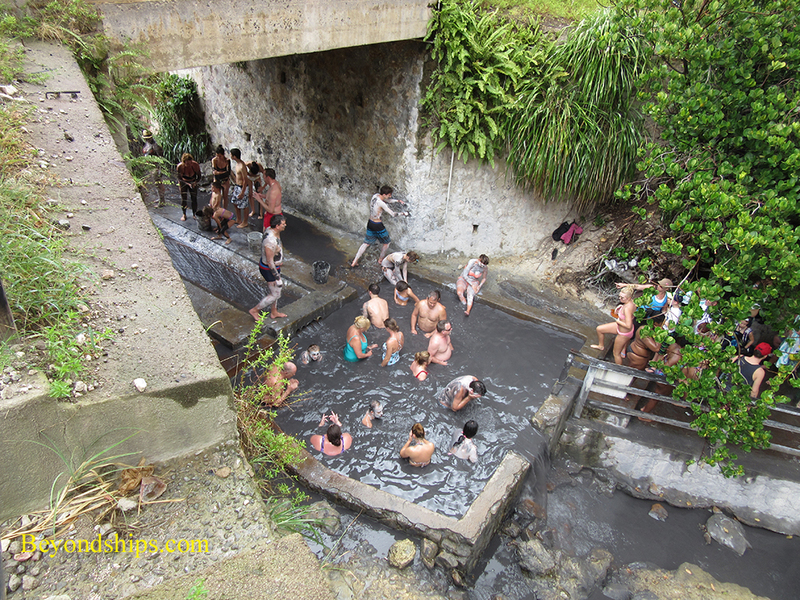 A concrete pool has been constructed by the bridge so that visitors can have a mud bath utilizing the geothermally-heated hot water from the stream. Some claim that these baths are therapeutic and good for the skin. In any event, the people taking them seemed to be having a good time. The drive back to Castries is another hour and a half. Our driver took the same winding roads as on the way to the volcano. Consequently, most of the passengers slept on the way back to the ship. If you are not with a tour, there is an entrance fee for Sulphur Springs National Park. It includes admission, the interpretive center, and the guided tour. There is an additional fee for the mud bath. Above: The Drive In Volcano is part of the Soufriere Volcanic Centre. Indeed, the town of Soufriere is in the shadow of St. Lucia's most famous landmarks, the Pitons, which are volcanic domes. 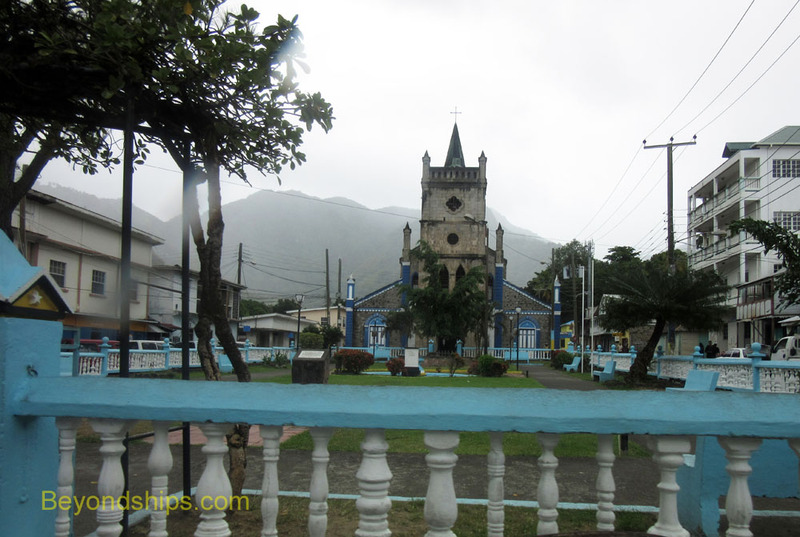 Below left: The main square in Soufriere. Above: It is a long drive from Castries to the volcano. To break the journey, we stopped in a quiet fishing village. Below: The interpretive center at Sulphur Springs National Park. Above: Scenes from the drive in volcano.